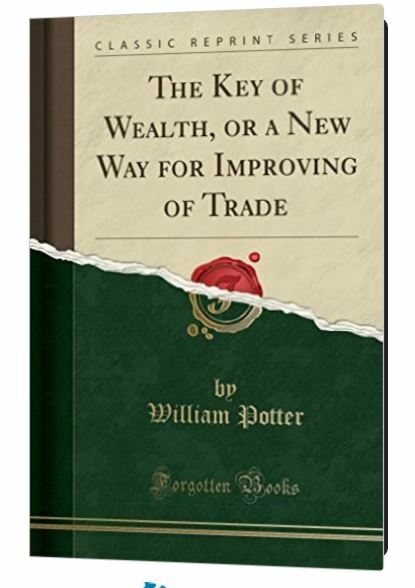 In 1650, William Potter, of London, published a folio volume entitled “The Key of Wealth”. The very same year, Potter also published in quarto form “The Tradesman’s Jewell”. The latter actually includes the former. Potter sought to demonstrate how trade could be stimulated and wealth increased by means of paper money. Therefore, paper money was the “Tradesman’s Jewell”. These two publications were followed by a proposition submitted to the Council of Trade for the creation of wealth. The basis of his idea called for the increas of the circulating medium of exchange (money) would increase trade without increasing proces (id/Key to Wealth p15). Potter argued that the exchange of personal credits that were well established and freely accepted, would thereby increase trade. He wrote: “If you can furnish credits which will circulate, you have a good circulating medium.” We must keep in mind that this was written in 1650 and thus precedes the Bank of England, which was set up in 1694. Potter argued that to ensure the circulation of these credits would be that several tradesmen should cause a number of bills to be printed, the face value of which would be verified, and then they should lend them to each other demanding the same security as if they were money itself. Borrowers would then stand behind secured to the company and agree to transactions half in these bills and half in goods in trade and that these bills would be redeemed for money upon demand. The bills should be redeemed every six months. Potter recognized that money was not restricted to anything in particular for the essence of barter was at the base of everything and that money was only an agreed upon medium of exchange between two objects. What Potter was really proposing was not to create paper money from nothing, but to monetize the essence of barter. In this way, he saw land as inherently an object of value. If bills were issued to monetize land, yes he would increase the supply of money, but dig deeper. He was really trying to increase the velocity of money. The mercantilists saw the wealth of a nation was its gold and silver. If that was wealth, they it did little for the economy because before banks, coins was just hoarded so the velocity of money was extremely low. Someone would become a millionaire, but they would hoard their money and not lend it out. Potter was looking to actually increase the velocity of money and that was his key to wealth and this regard of fine-tuning what he was saying we arrive at the correct understanding of what he proposed before Cantillon and John Law.